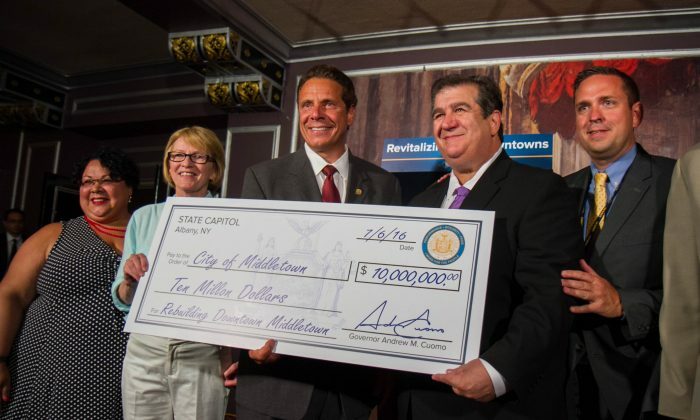 MIDDLETOWN—Governor Andrew Cuomo came to the Paramount Theatre in Middletown on July 6 to announce a Downtown Revitalization Iniative (DRI) grant of $10 million for the City of Middletown. “We have a thriving business community, merging innovative educational facilities, and institutions with an expanding and diverse population,” he said. Middletown’s downtown can be summed up in one word: potential. Cuomo said Middletown was competing against over 100 other municipalities. There are 10 Regional Economic Development Councils (REDC) that were charged with choosing nominees for the grant, and at the end of June, the Mid-Hudson REDC sent their nominations to the governor. The Mid-Hudson Region includes Orange, Dutchess, Putnam, Rockland, Sullivan, Ulster, and Westchester counties. The Downtown Revitalization Initiative (DRI) grant, awarded to only one community in each REDC, focused on communities that were “ripe for development” where “tomorrow’s workforce will want to live, work and raise families,” the REDC website says. The grant is intended to jumpstart public and private investments already happening in a municipality and spur further economic growth. In making its selection, the Mid-Hudson REDC considered several criteria. It looked for downtowns that were compact with well-defined boundaries. No limits were given on the size of the population, and the area did not necessarily have to be in the downtown. Investment plans were supposed to address economic development, transportation, housing, and community projects “and can be leveraged for additional investment,” the REDC website says. Ultimately, the grant envisions an active, desirable downtown “with a strong sense of place” and ways to attract so-called “Main Street” businesses that cater to the locals. Before the awards, DeStefano said the grant, if awarded, would be spent on the city’s Business Improvement District (BID) and the former Psychiatric Center that is being developed for businesses. Middletown’s BID includes an arts center and a recently completed walkway on the formerly one-way King Street to provide what the mayor calls “walkability” for downtown residents. Middletown has long-standing neighborhoods within close proximity to the BID, an important criteria of the grant to attract public and private investment. The city has also been successful at bringing a balance of educational institutions, athletic facilities, transportation, and affordable housing within the BID. Touro College of Osteopathic Medicine opened in the city in 2014. Fei Tian Academy will soon open at the former Psychiatric Center. A transportation hub is being planned near the city center. The city has selected a contractor to build a skateboard park within the BID for younger residents. A private investor is building an indoor soccer facility in the downtown. The Mill at Middletown, an old hat factory on Mill Street that will provide housing for lower income families, also has a café inside that will provide training for hospitality jobs. Da Tang Supermarket, which offers a wide range of Asian and western grocery items, opened its doors in the downtown this past spring. Middletown’s Architectural Review Board has sought to retain the city’s historic look, and the city has made an effort to keep the BID safe and clean. Cream rises to the top. You won and you should have won.